Mary explains Vector and Pixel files to me and another gallery visitor. And while I understand some things, I don’t understand all of what she says. To make it clear she describes how her lines are made. A Vector file makes a clean, intense line, she says as she shows me one and compares it to a pixellated line. Once I see the quality of the line, I understand. 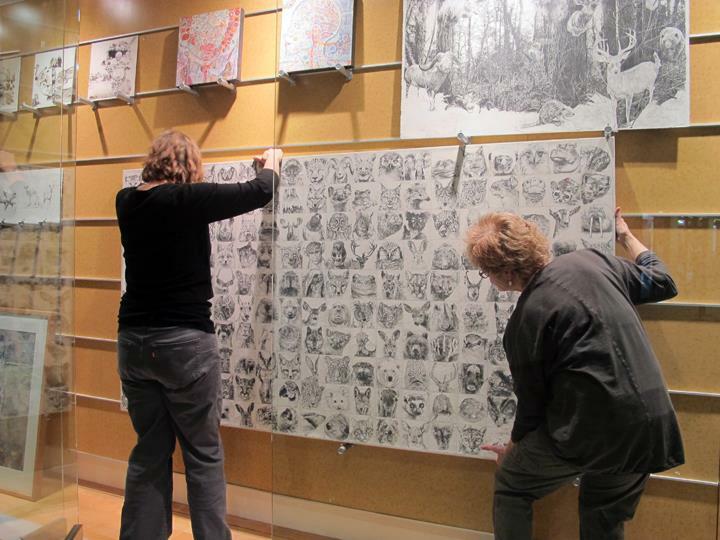 We discuss her digital drawings and compare them to traditional printmaking, both in quality and process. I suggest she teach a class ( teach me is what I really think). 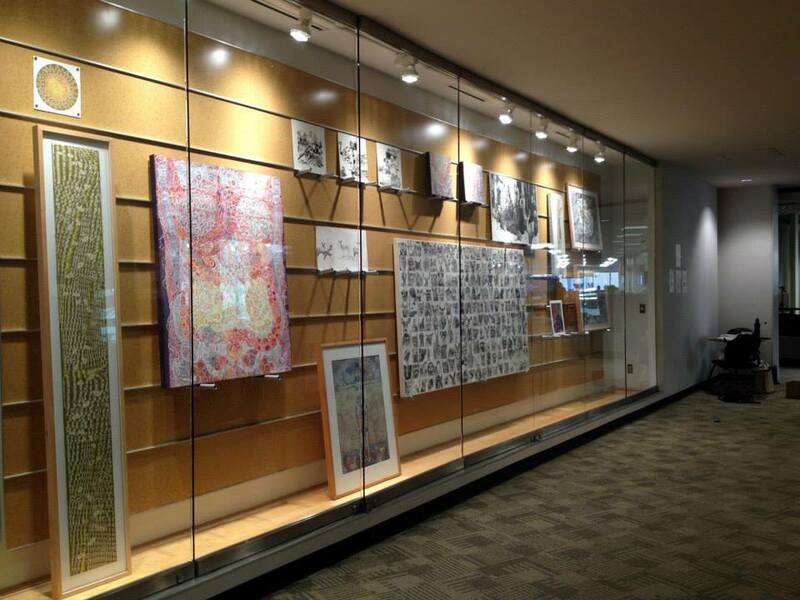 There are three large works on paper, on the east wall of the gallery. 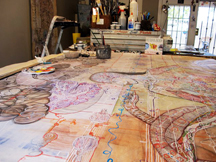 Each of the compositions stands as a unique work though they connect directly through process. One design uses the other, and then again. Mary draws with graphite, inks, gouache, and she also draws using her computer. 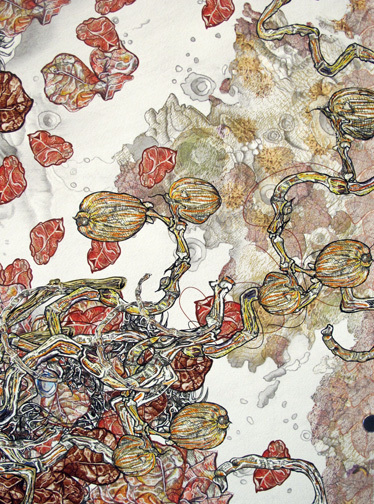 Below are details from the large 42 x 42″ works on paper. Can you see how they connect? One is a digital photo of the original graphite drawing. The second is the original graphite drawing with added media, all completed by hand. The last one is computer generated and uses the other two. Note: My photos are not perfectly aligned. I shoot the right side (first 3) and then the left (next 3 of the drawings. Mary places the viewer above the work. 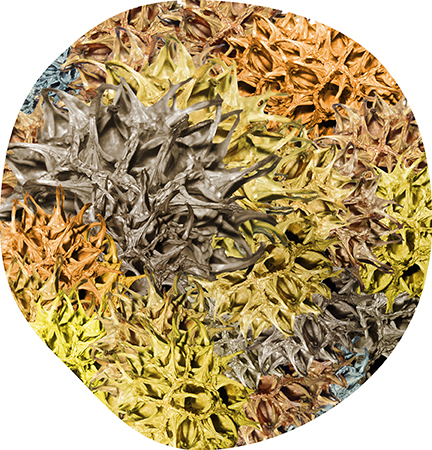 We hover perhaps in space, and see the top view of a multi-layered landscape that in this case includes: the moon, the Estrella Mountains, and the beautiful Arizona flora. I look closely at the work and identify elements but then I have to stand back to take it all in. The brilliant details captivate. Along the west wall Mary shows a series of small drawings and digital prints. She explains she works things out on these smaller works in between stages of the larger works. Here are photos of two and a detail shot of a third. 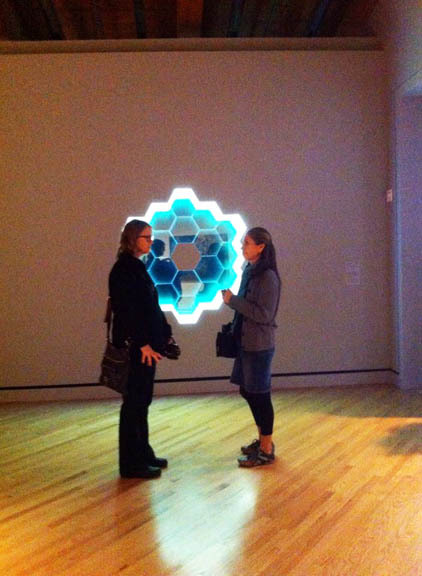 I ask Mary about the title of the exhibition, Inflection Point. She explains the mathematical term. An inflection point is a point on a curve at which the curve changes from being convex to concave. I understand, I am familiar with the concept. She identifies it as a changing point, a point of transition. I’ve known Mary for a long time – she continues to mesmerize me with her curiosity, her attention to detail and her growing skills. She is always on to something new and wonderful. I will drop in to see the exhibition one more time – in case I missed anything. 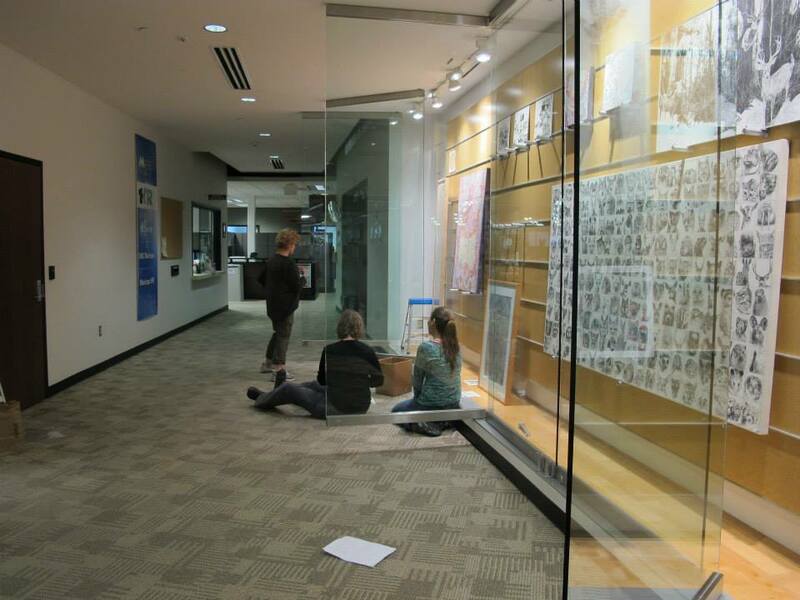 Inflection Point drawings opened this First Friday and will run to the end of the month. I am one of 102 artist selected for the Sate of the Art, Discovering American Art Now. Carolyn and I travel to Bentonville, Arkansas to attend the opening at Crystal Bridges Museum. We hoped Mary would come with – but you can’t be in 2 places at one time and she is in Alaska. I write about the 4 days we are there, in my blog today. I share the link here. Carolyn captured a feral kitten she’s calling Feisty. The white cat was small but wild; with patience and know-how Carolyn helped the kitty become healthy and now it’s learning trust. Feisty will be ready to make his way to a good home soon. After weeks of working with the cat Carolyn wants to introduce the feline to another person, and at her request I spend an afternoon working in her studio. I manage to spill Feisty’s water and food but in general the first visit goes well. After another visit the kitten appears to recognize me. I have a decent sense of cat anatomy, and between that and Carolyn’s cat behavior knowledge – Feisty settles in my arms. I am like a tree limb – as he hangs in relaxation. Carolyn’s studio is like a research lab for animal study. Organized along the shelves are skeletal bones and mummified critters that she has found and collected. 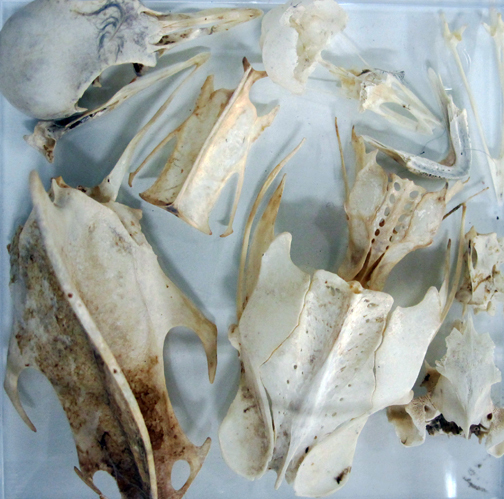 Here are the newest additions – a series of bird bones she has cleaned and preserved in small transparent boxes – they’re magical. Will you be drawing Feisty? I ask Carolyn after my first visit with him. I don’t really draw domestic animals, she answers. I’m amused because that one day I would not have described the kitten as domesticated. While in the studio I note all the animals on the walls, staring at us that afternoon. Here are only a few of them. There’s all the Preservation series as well. 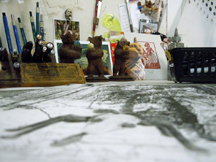 Current work – a graphite on prepared paper drawing – sits on the table most of the time we are in there. Feisty sits nearby it. A lead pencil next to a rendering of a very small bear. I don’t ignore the cut outs of animals of all sorts – that are arranged in bags and boxes. On my visit last week I mention to Carolyn I want to blog about the 3 dimensional and 2 dimensional activity that makes up her studio right now. Of course it includes Feisty, the now truly one domestic creature among all the wild ones. All of Feisty’s taming and progress is posted into Carolyn’s Facebook page and will continue until he finds a good home. I mentioned I am familiar with cat anatomy. I spent last summer studying and making numerous works about it. This summer I learn more about animal behavior and the creation of trust. One cannot help but consider human behavior and how we treat the most vulnerable among us, it says so much about us as a people. 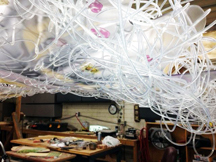 If I ask you to give me the connecting thread that moves through Carolyn’s studio, what would your answer be? 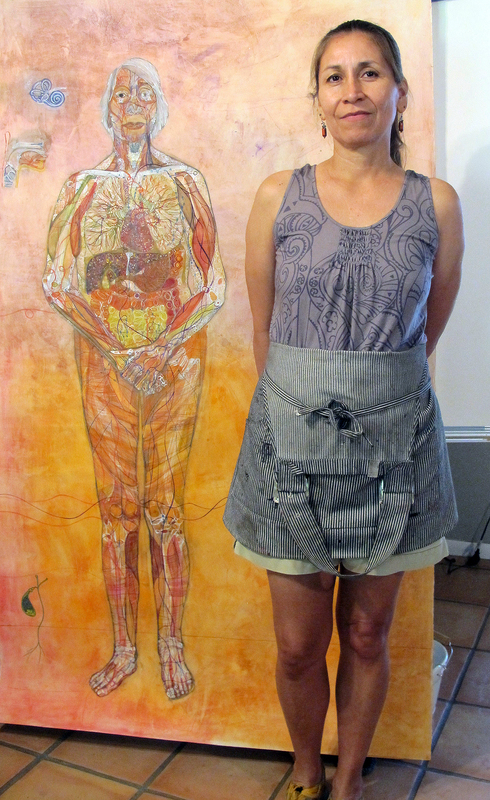 Monica is working on a large anatomical drawing of her mother Elisa. I am impressed by her use of a warm orange background broken up with several areas of purple wash. The color palette is so inviting and she tells me that orange is the color of creativity and in Yogic studies it is associated with the pelvic area. These background colors appear full of emotion and the paper has also been coated with gesso and a very thin layer Golden Moulding Paste to give it a slight texture. I talk to Monica about how it is possible for her to work in direct contact with the surface of the figure. She explains that casein is a protein and as it is touched (she rubs it with a cotton cloth) it acquires a polished look. In the drawing Elisa’s hands are clasped in front of her body and I understand that she is quite handy. She builds and repairs things in her home and has raised six children while working as a hearing and speech professional in the schools. Monica includes a drawing of the inner ear in the space next to her mother’s head. It floats as a symbol for her work. The compact organs in the chest and abdomen are depicted in strong vital colors and will remain visible as the work progresses. 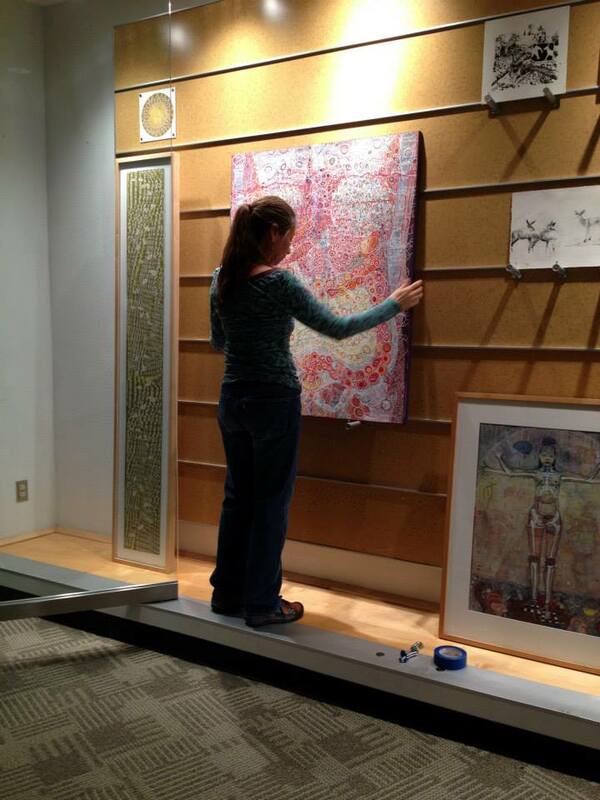 Monica has decided to omit the skeletal structure in order to make the organs an intricate, energetic focal point. There is a space where the gall bladder once was and because it has a very plant-like look and was removed in real life, it now exists on the ground plane. Monica places the drawing on her upright drawing table so I can photograph her standing next to it –I am thinking about illustrating scale. Elisa looks directly forward and Monica stands beside the figure. I convince the artist to pose as the figure poses, hands clasped in front. It is the opposite of the way Monica usually stands with her hands together behind her back. Both women look forward, strong, direct, engaged and engaging. Monica and Elisa, notice the gall bladder in the lower left. Carolyn brought me a beautiful gift last week. 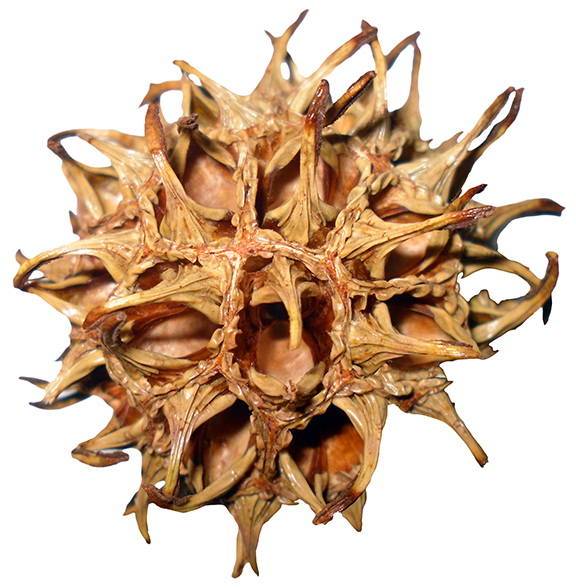 It was this spiky pod. I later photographed it and took it into Photoshop and Illustrator. I made it into what Adobe calls a symbol. It is a digital instance. I make them a lot, and then I sometimes use them in a layer or texture or I like to take these instances and make them into something out of context. 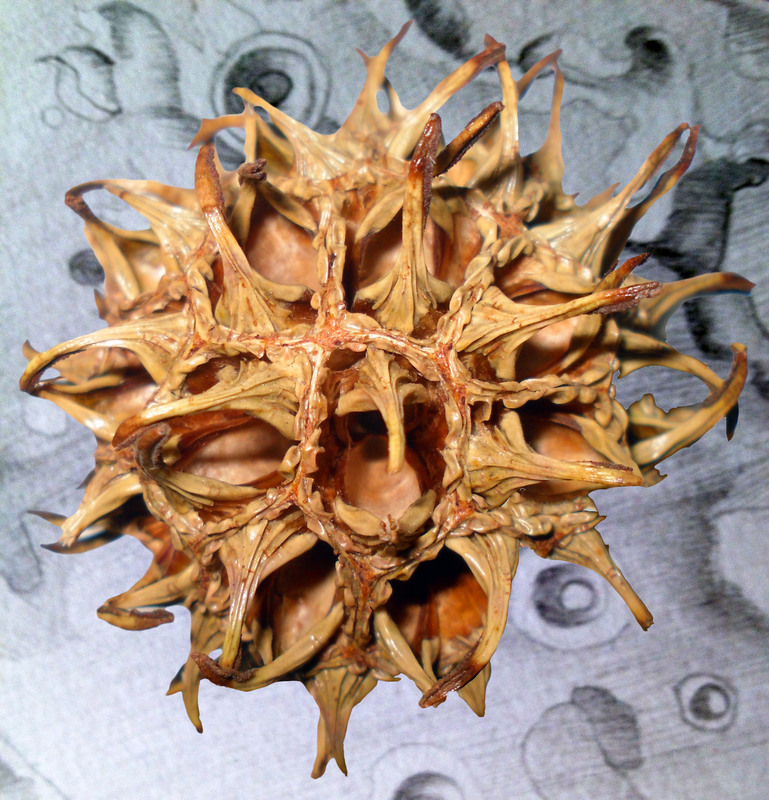 This pod will become some sort of hovering celestial body in my drawing of the moon and the Estrella Mountains and then become part of my user-defined library, my collection of digital instances. 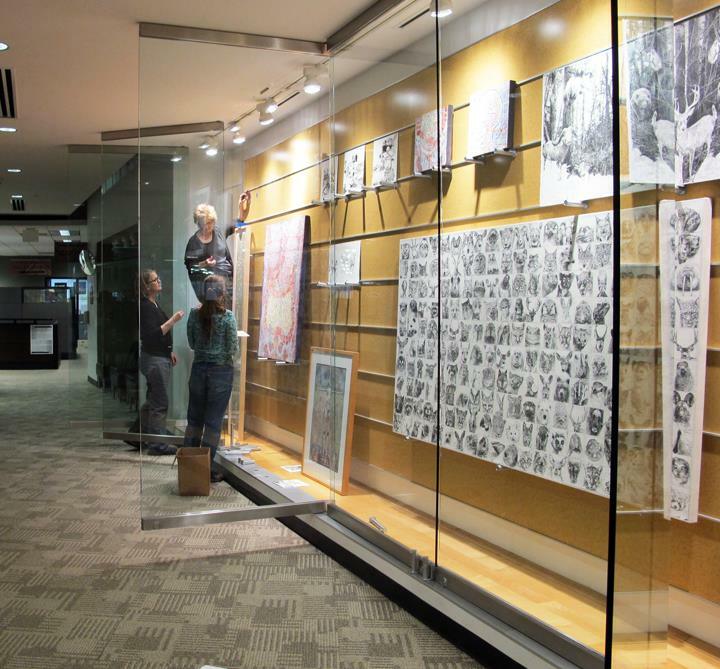 Mary Shindell talking about her newest drawing project. I haven’t been to Mary’s studio in a while, so I arrange for a visit. Mary has two spaces, her home space and her shared warehouse space. She has been drawing, so this takes place in her home studio where things are clean and climate controlled. Before I greet Mary, I first need to greet Zsa Zsa, who has a very big grin on her face. Mary’s studio companion, Zsa Zsa the french bulldog. In Mary’s studio I check out some of the things she keeps on hand. Like myself, Mary is a big studio nester. It functions as a cocoon of creativity, and the work space is littered with objects, past works, sketches, images, and art supplies. Some studio treasures on display. Many things are familiar, but there is always evidence of fresh activity. Today I see that some of the furniture is moved and there is a large in-progress drawing filling her drawing table. View of studio with in-progress Moon and Estrellas drawing on drawing table. I recognize that this is one of her satellite drawings, the title referring to the straight down perspective. But this drawing literally makes use of satellite imagery of the Estrella Mountains. Chosen because they are local, but also for how great they look from above. This imagery is being combined with hand mapped moon drawings that pre-date satellites and are available for public use. The drawing becomes an unconventional landscape where the land and the moon are collapsed into each other. Detail of in-progress drawing, Moon and Estrellas. One of the first things I notice is that Mary is using symmetry in this drawing. This is a great reminder of how far back our relationship goes. I was fortunate to see Mary’s impressive 1978 MFA show at Arizona State University, where a number of the drawings were symmetrical. Here is a drawing from that general body of work. The symmetry she is using now is for the purpose of segmenting the drawing in modular units. This could have been done in the computer, where a section could be drawn and then easily flipped or rotated to create matching modular parts. But Mary does not want the sections to be so exact; she is looking for the subtle energy that will be created by the slight variation that hand drawing creates. Where this drawing will end up is still open-ended. After the hand drawing is completed, it will be scanned and worked in the computer. Where it will undergo steps with the idea of continuation. Where maybe there won’t be an exact end, just pauses. This is an influence of working on the computer where visual information in the layers of past pieces is easily used to start new pieces. Here the process will stay contained within one piece. Moon and Estrellas, in-progress on Mary’s drawing table. But Mary is playing with one more element of variation in this work. Along with the natural variation of hand drawing she is introducing the hand of another artist. Mary is drawing one side, and her studio assistant, Pere, is drawing the other. In their close working relationship, they are playing off each other as they make subtle decisions as to what to emphasize and how to draw from the sources. In some areas Mary has taken the lead, but in other areas Pere has worked ahead and Mary responds accordingly. The differences in their two hands isn’t immediately obvious, but does add a subtle discordancy to a drawing that a viewer would assume was drawn by one person. As the first phase of what will become a multistep digital drawing, this is just a path to something else. It will be an artwork that plays with the differences between pencil drawing and digital drawing. Mary doesn’t know exactly where this is taking her, but does know that it will become her January show at Five15 Arts Gallery, Phoenix. Opening reception will be January 2nd, 2015. Estrella Mountain Community College in Avondale invited the three of us to show for the month of March, in celebration of Women’s History Month. The exhibit is titled Body Creature Nature. We installed on Tuesday. It was unusual in that it’s not an actual gallery, but more of an exhibition area. Think striking museum glass case – because that’s what it is. We are pleased with the visual result which is rich, warm and inviting. Below are the one larger work from each of us. There are some nice surprises in this particular exhibit – things you might not have seen before. Below, we work together easily to install. Naturally conversation starts up with what might be next. The exhibit will run the entire month of March. Thank you Estrella Mountain Community College. And a special thanks to Kathleen Iudicello, PhD. the Interim Dean of Academic Affairs. After the install we spent the afternoon talking about what may come next. Out of that conversation we decided to make changes to this blog. I’ve already changed a few things in the layout. While the blog was created for our last exhibit Creature Man Nature, we plan to continue working together and consequently the blog will reflect things as they move forward. Mary, Carolyn and I have been busy since our last posting back in April. Among other things – Mary had a solo at 515 Arts. Carolyn and I went to New York to go see art. We saw lots of it. I became more interested in space. As artists we always deal with it but somehow I became more engaged in the experience of art – space – work. Mary was also in New York, she went for her son’s wedding. I caught up with her last week on the last day of her show. I mentioned to her that Carolyn called me earlier in the month. She’d had an idea pop up while working in her garden. It could be the start of our next project – a clear collaboration – an installation. We talked specifically about individual area, handling space and the use of materials. I liked the abstract very much. I told Mary I would let Carolyn give her the run down. 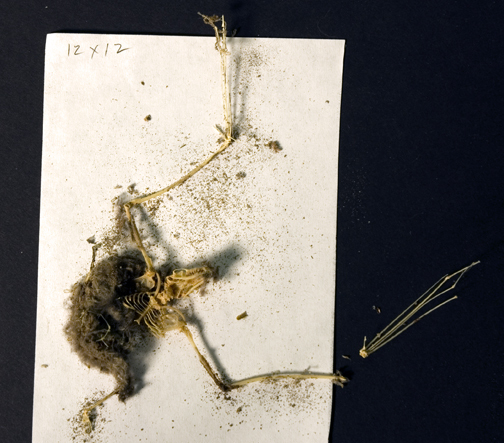 In the meantime Creature Man Nature – a very small version of it – will show at a college here in the valley, this winter. As we wind down from a busy summer/year and begin a new art season we’ll be considering what comes next. Will we keep this blog? Change its name? Go outside of Arizona? – TBD. In the meantime today I spent the afternoon at Carolyn’s studio. I am working on small anatomy studies of creatures … that’s her arena … I wanted to see a bat skeleton she mentioned having. I forgot my camera. She brought out hers and here are a few photos of things that caught my attention. A good idea, some interesting photos – not necessarily directly related but are the cause of the update and this post. Carolyn and I receive an email from Patricia Colleen Murphy, the founding editor of Superstition Review. Congratulations on your exhibition at Mesa Center for the Arts. I’m so proud of you! It’s really exciting. And I have some great news too. Our launch party has grown so big we needed a new venue, so we’re going to host it at MCA. We’re planning for Thursday April 25, and our guests will get free entrance to the museum before the launch party starts at 6:30. I am just thrilled that your work will be up while we’re there. I’m writing to invite you to the party and ask if you might be willing to say some words about your work while we are there? And might we run a piece on our blog about your show? I’d love to include Mary too, though I haven’t met her yet. We accept Trish’s offer, and set a date to meet for an interview. It’s an honor for Carolyn and I to connect with her again. Superstition Review featured both of our art work in their magazine last Spring, and we spoke at their launch as well. We connect on Friday, in the gallery. Trish meets Mary and quickly offers her a feature post this Spring. Trish and Dominique looking closely at Carolyn’s work. Mary share her process, while Dominique takes notes. Carolyn and Trish look on while I walk around. Dominique and Carolyn talk, while visitors walk through the space. While we conduct interviews – museum visitors enter and exit the gallery. Up the hallway is the activity of a new install. The usual people move about doing their work. I like the feel and naturalness of everything. Photos of our meeting include artists, Trish, and the bright Dominique Brigham, who had plenty of questions for us. She’s writing the feature. There will be a few people reading and we’ll be speaking – artists and writers … a good match. I enjoyed the launch Carolyn and I participated in before. It was a memorable and multilayered experience – out of our (regular) element as visual artists. 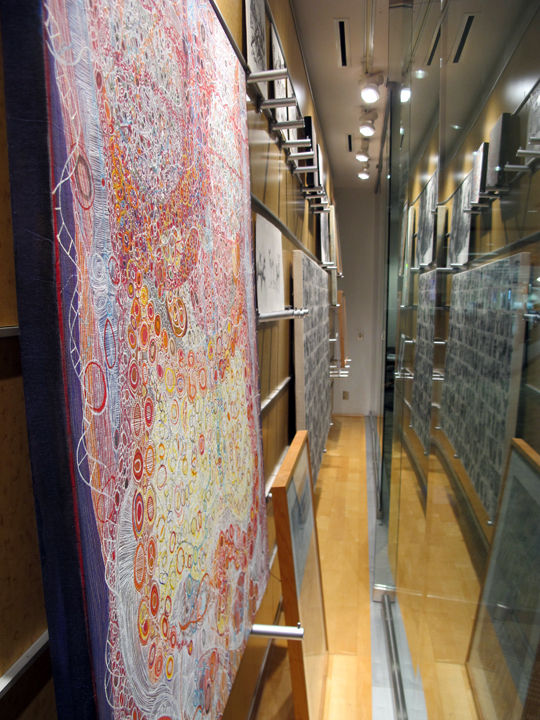 This time guests will see the art work before we speak ( last time we showed digital images ). We plan to talk about how Mary, Carolyn and I began our partnership, and how we see our work evolving. A productive meeting/interview with Superstition Magazine at Mesa Contemporary Arts – I call it one fine Friday morning. We’ll be seeing everyone on Thursday April 25, at the Issue 11 launch party. A congratulation to Superstition Review and Patricia Colleen Murphy on their continued success. A note: The content for this post evolved out of someone asking me how Superstition Review selects participants. This is first an educational blog – we address process: work and general events. I share the general event, and in particular – I suspect the how always varies. In this case, my guess is that our work was in the right place at the right time (MCA). And most importantly Patricia Colleen Murphy knows our work.. Your Pubic Awaits, My Artist Friends! The Musings of a Curator: What is art?